The official opening party is organized by the Cologne Board of Lesbians and Gays (KLuST e.V.) in cooperation with the community of innkeepers Schaafenstrasse e.V. From 2019 on the opening will take place together with the Wedding Night, which reminds of the equal legal status of lesbians and gays concerning marriage. The Main Party is launched on Saturday before the Parade. 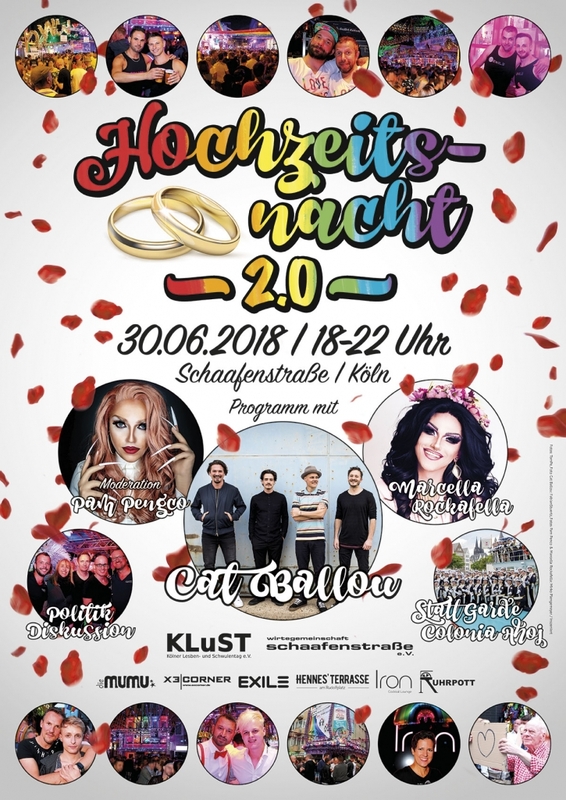 Every party in Cologne can apply for these on the condition that your party does coincide with LGBTIQ* fundamentals and grants access to people of all sexes and all sexual orientations. The advantages of your party being Opening Party or Main Party are obvious: apart from showing a real sign of solidarity and support for ColognePride, your party is included in our media activities, and being a co-operation partner, it will be extensively and preferentially advertised. If you want to apply for your party becoming Opening Party oder Main Party we are looking forward to your mail that contains a brief concept.